Sometimes in your “must have, must wear” watch collecting you come across models that for all sorts of reasons catch your eye, then you buy. Not on impulse you understand but more in the expectation that what you see will work as you wish and do everything you hoped they’d do. My “Expectations” series reflects on some of the models I bought in the past that I still have and that performed exactly as I hoped and wanted and in most cases did considerably more than that – they excelled. Also the models shown here are relatively inexpensive and could be considered low to mid-priced at the time of purchase, depending on your income perceptions of course. I haven’t listed prices as some may not be current, but you can of course just Google them and you’ll probably get a fair indication. I Post them in no particular order (just as they came to hand out the display case), they are all “as new and perfect”, though some may have alternative bracelets or straps, but that’s just me – needless to say I still have the originals. 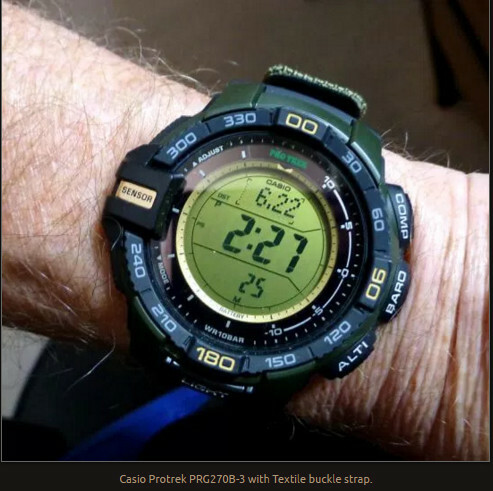 Expectations 1 – the first one out the case is this digital Casio Protrek PRG-270B-3 (ABC) – Textile strapped, 100 m Water Resistant model weighing at just 62 gms. So why this one? Well it does everything it’s supposed to do and does it well. It’s very easy to use and doesn’t require constant referral to any instructions. It is uses the standard Casio control set up (Mode lower left, Adjust upper left and so on) and once you know the sequence, it’s easy. It’s also one of the easiest to read with one of the best contrast digital displays I’ve found. The textile strap fits my 165/70 wrist perfectly as it swings 90º from the case and it’s pretty decent quality. The 3 sector default display is set as I like it as – (top down) Month and Date, Main Time and Seconds. You can of course set it as default to other views depending on your preferences. My old review is – https://watchspace.wordpress.com/2015/06/23/my-casio-3000-replacement/ – and says it all really.